Someone asked me recently what my favourite brewery is. I thought about it for a moment and then realised, all things weighed up, it’s The Kernel. Consistently good beers that are right in my ideal flavour profile (usually tropical hops, long but smooth bitter finish), and I can’t remember trying one of theirs that I haven’t liked. Which I definitely can’t say for most breweries. 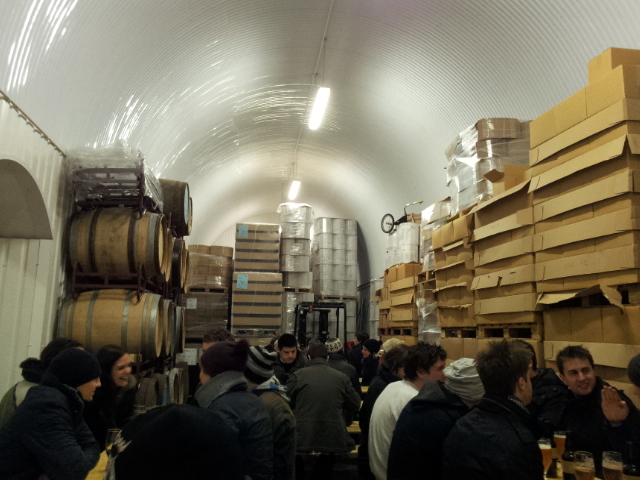 But, surprisingly, as a Londoner I had yet to visit the brewery, which is open every Saturday from 9am-3pm for takeaway or to drink on the premises. 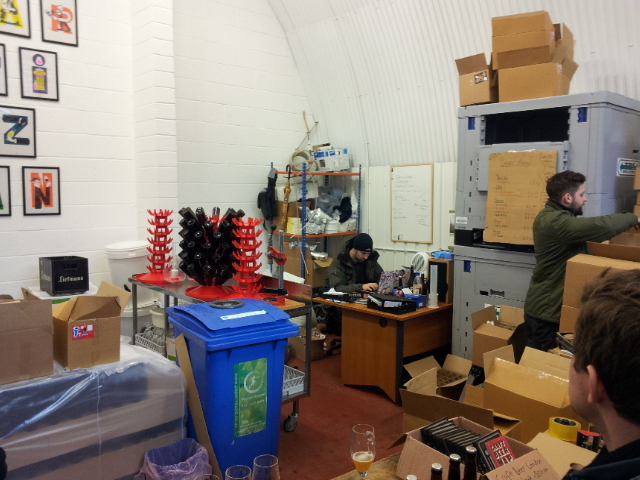 So, with a couple of friends, we ventured into a trading estate in deepest Bermondsey to get some of London’s finest beers fresh from the source. It was cold on Saturday. Bloody cold. Snow flurries and freezing winds. Maybe not the best of situations to go to a brewery which, in my experience, are usually cold places to start with. But, the plan had been made so we stuck with it. Passing big flat blocks left and right, a railway bridge ahead, we turned the corner into Dockley Road, and I had to trust my friend Pat (who’d visited before) that we were headed in the right direction. The Dockley Road Trading Estate didn’t look particularly promising or inviting, but a few steps past the gates I spied a honey shop, a greengrocers, a fishmongers, a bakery, a charcuterie and, right at the back, The Kernel. Seems like a great place to spend a Saturday morning, but possibly not when it’s snowing. On a spring morning, it would have been very pleasant indeed. Still, there was beer to warm our cockles. It was around midday and the wooden tables set aside in the brewery for drinkers were already filling up. We went to the bar and I was surprised and pleased to see that as well as the wall of various bottles on the counter, there were 6 or so taps behind offering some fresh draughts. I went for a table beer to ease myself in. An ideal first drink, light and crisp with a bitter grapefruit hit. And my friend Pat went for a single hop pale ale, I forget which one, but the two together were £5. That’s not at all bad for two 330ml glasses of beer. 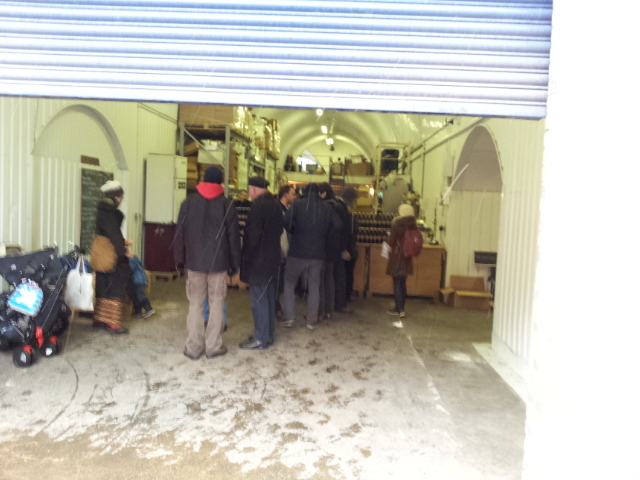 The place was buzzing, despite the cold – all the drinkers were wrapped up warm, gloves, hats and scarves abounded. The mood was friendly and relaxed. We stayed for another couple and our friend Steve joined us. I tried the Bière de Table (a light, slightly banana-ey saison) and the Citra IPA (just as you’d expect a Kernel IPA). As we were in the area, we decided to swing by Partizan as well. I’ve been hearing a lot about Partizan, and after trying a pale ale last week in the Earl of Essex, I was keen to try some more. On the way, we popped into the Monmouth Coffee tucked away behing The Kernel and Steve bought a pack of the most aromatic coffee I have ever smelled. A short trip down the road brought us to Partizan. Much quieter and more unassuming than The Kernel, we walked into the brewery, made our way through the piles of boxes and crates, past the mash tun, to the counter. All bottles here. We each got a bottle of pale to drink while we decided on some takeaways. A 15% discount on a box of 24 meant we each got to choose 8. The had 3 saisons, a pale, 2 IPAs, a porter and a stout, from memory. I got a selection and we trudged back to The Kernel to pick up some more for that evening. This was turning into a very boozy day. But I guess when you get to a brewery at midday, there’s only really one way the day can go. 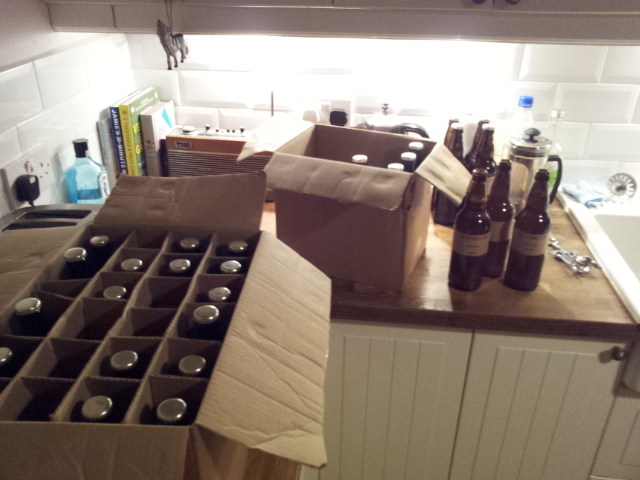 After the pales, I decided to go for the LBA stout which was very good. Much more suited to the weather than the pales and IPAs. Deep, warm and toasty, full bodied with a lingering citrus hop flavour. We noticed the crowd at the bar was growing as it was nearing last orders, so we joined the back of the queue and once again, beers in hand, decided on what beers we wanted to leave with. I got myself some Tables and a couple of other pales. Always good, always dependable. Then we headed to a friends house to drink some of our spoils. Tasting notes are a bit thin from here on in, although I didn’t try many new beers so no real drama. I had the Partizan Galaxy Saison, which I remember being lighter than its 5.4%, with the trademark Belgian yeast aromas and flavours. That evening, we popped into the Effra Social, an Antic pub that’s been open less than a month, for a quick drink on the way home. It really does feel like a social club and has a very 60s grandad kind of vibe. In a sort of cool way. They had a couple of interesting beers on, and I tried the East London Brewery Foundation Bitter, which I found a bit too thin, bitter and astringent for my tastes. And then it was off home to eat leftover rice & peas while watching Stewart Lee. Homemade steak and homebrewed ale pie! 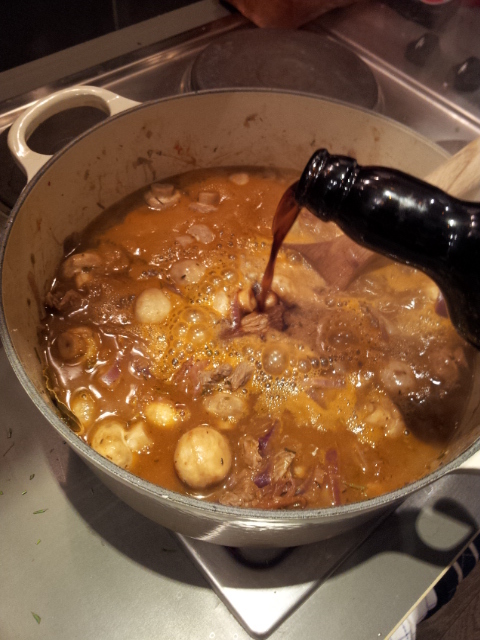 The next day, spurred on by this relentless winter, my wife and I decided to make a hearty steak and ale pie, and whilst looking through my beer cupboard for a suitable bottle, I thought, “Why not use a homebrew!?”. My 6-odd % porter seemed like a perfect candidate: strong, slightly sweet finish and very dark. So in it went. And the stew turned out great, rich and tasty (although, to be fair, it doesn’t look particularly appetising in the picture). The only issue is that when it came to baking, I left the pie in the oven a touch too long which resulted in the crust being a bit flakey and not as buttery as I like it. Still, with some simple veggies and mustard mash it warmed us up, and it felt nice using my homebrew as an ingredient. I think we’ll be making this again. How soon depends on how long this bleedin’ winter lasts. A good read. Not had much from The Kernel (living up North and all), but what I have had has been damned impressive. Have had nothing by Partizan yet, but am hoping that both are well represented at The Independent Manchester Beer Convention – aka IndyManBeerCon later this year.